It’s been five years since I started this blog! Time flies and a lot has happened since. Thanks for being along for the ride. What better way to celebrate than a blog post? This post is going to be short and to the point. Many of us run HSRP or VRRP. 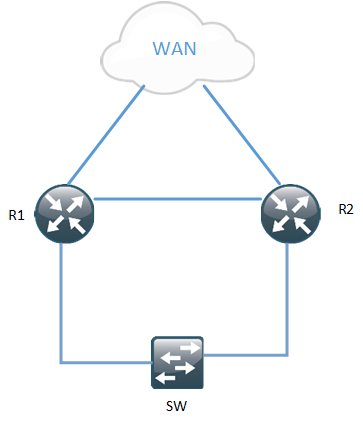 It is quite common to run it in a topology where you have dual routers and dual exits to the WAN and you don’t want to black hole your traffic. Unfortunately there is no way to directly configure HSRP to check the status of BFD running on your WAN interface. That does not mean we can’t solve the task at hand though. BFD is supported over static routes. What if we insert a dummy route into the RIB when BFD is running successfully over the WAN link and track that this route is installed into the RIB. If it is not installed it must mean that BFD has failed and that the HSRP priority of the active router should be decremented. I’m using BGP in this case to have BFD packets sent over the link. There needs to be a protocol registered with BFD for the packets to be sent. It would be more likely for the ISP to configure a static route using BFD as well. If you are already running BGP, this configuration may be overkill since you could track routes coming from BGP. To trigger the BFD packets being sent over the WAN link we first have a static route pointing out the egress interface and the next-hop. Then we put a standard IP route statement which will insert the dummy route. It is important to point out the egress interface though for single-hop BFD. EOT is used to track if the route is installed into the RIB or not. The HSRP priority is decremented if the route is not in the RIB which will make the standby router become active. We can then test if it works by shutting down the interface on the ISP router. What are the advantages of this setup compared to IP SLA? The drawback may be that you have to get your ISP to run BFD and that they need to put a static route in on their side as well. This can be a real route or a dummy route though. Hopefully this post was somewhat useful and you’ll stay with me for another five years. Thanks for reading!